I promised you more photos and info on boom boats, and today I’ll deliver that plus a bonus. Tim and Theresa Lindseth of Thorne Bay were here in the 1980’s and ‘90’s and Tim worked as a boom man. The Lindseth’s generously shared information and photos with us so that we get to see a little of the Thorne Bay sortyard when it was running! The sortyard ran from the 1960's to the year 2000. Tim and Theresa's photos are from the 1990's to 2000. Tim was there in the 1980's when Thorne Bay was the largest sortyard in North America. He tells me that they were processing 3.5 million board feet of wood a week. I just had to give you a minute to let that soak in. That’s a lot of wood. When you drive into Thorne Bay today you are greeted by the logging grapple, locally known as “the claw.” It weighs 44,000 pounds. Before retirement the grapple looked like this. The grapple hung from this Cypress Equipment brand A-frame, and could pick a 100 ton bundle. Above, that little bundle in the jaws of the grapple is nuthin'. It could pick bundles so big that the jaws wouldn't close. The operator worked in that little yellow cab in the center of the photo above. The cab hung right out over the water so that he had a good view. On shore there were four LeTourneau stackers to move wood around. These are wa-ay bigger than the Cat 988 in the last post. For you machine officianados - there was also a Dart stacker and a Wagner stacker, so the machines could be rotated for maintenance. Photo courtesy of Tim and Theresa Lindseth. Back row: Stacker operator Chris Lewis, A-frame operator Eddie Nelson, Boom Man Tim Lindseth, Mike McKim, Bander Tim Lindseth Jr., Bander Wade Adamson, Bucker Joe Holland, Danny Killian. Front row: Jack Sims, Lorraine Sims. The logs came to the sortyard via trucks as well as floating log rafts and it was all “camp run.” Spruce, hemlock, cedar, saw logs, and pulp wood were all mixed together. The bundles had to be opened, sorted, and re-bundled to be sent to the proper places. Every branded log had to be accounted for. The wood was handled two to four times in the yard. In the Thorne Bay sortyard in the ‘80’s there were four to six boom men working a rotation so that there was coverage seven days a week. They worked nine to ten hours a day in the summer and eight and a half hours a day in the winter. When the bay froze over they broke up the ice with their boats and kept working. One year it froze so deep that “you could drive a Volkswagen across the bay.” That didn’t stop the work, though! Jerry Manier chainsawed through the ice all the way around the log raft so that they could keep working. Below was a year when the ice wasn't quite that thick. On the back of the boom boat above it says "Ketchikan Pulp Co." That was the company that ran the sortyard. Theresa said that K-Pulp took good care of their employees and families. Shutdown was from December 15 to January 15, and outside of that the work kept going. Tim ran a Marine Craft boom boat, made in the USA, that had an 8-71 Detroit engine so it could easily handle bundles and even move a raft when needed. Most of the boom boats had 6-71 engines. See where he is standing on the bow? That is layers of rubber to make a soft ‘bumper,’ called 'pudding,' on the boat so that he could push on another boat. Below that are metal teeth that stick out from the bow to bite into logs. Tim casually said that he had "a jillion tricks" for operating that boat and doing his job. From my perspective, that's a huge understatement. So let's see, you have to have the strength of a logger, the balance of an ice dancer, the reflexes of a racecar driver, keep the books straight on millions of dollars worth of product, and be hyper-aware of everything that is going on around you. All of that while working in a moving environment that can kill you in dozens of ways. It takes a lot of smarts, and those gems of knowledge that he calls "tricks" are really worthy of an advanced diploma on the wall. Boom boats steer erratically if you don't anticipate what the boat is going to do every second. There's no time to tie one up when you have to hop off for a few minutes. You set the throttle so that the boat is pushing lightly against the logs and then watch that the boat doesn't leave, while watching at the same time that you hit the log dog, and not yourself, with the ax. Some operators use bungee cords to hold the wheel and/or throttle in place. Pushing logs around with a boom boat is only a part of what a boom man does. The boom man builds log rafts, pulls wood out of log rafts, keeps a written record of all of the bundles that he moves, and is working hard All. Day. Long. He’s also paying attention to the work around him to make sure that the right wood is where it needs to be when it needs to be there. Boom men are quick, agile, and wiry. Everything that they work on moves, and logs roll, so they have balance like crazy. With political changes, production dwindled in the 1990’s, and the Thorne Bay sortyard shut down altogether in the year 2000. That photo of the LeTourneau stacker and the crew shows the last bundle of logs. Tim and Theresa are two of the wonderful people who had to make huge life changes due to that upheaval. (I’m going to do an ad here, and they don’t know I’m doing it. Yet.) The Lindseth’s started Welcome Inn B&B here in Thorne Bay, and it is very nice. Plus Theresa’s cooking and baking is SO good that my husband does a happy flip-out if he gets one of her cookies. So please say thank you to them for sharing their history by checking out their website and keeping them in mind when you visit Thorne Bay. Now back to our regularly scheduled programming. He's running a type of boom boat that is called a log bronc because it bucks, tilts, and twists. A coarse move on the controls can toss the operator into the drink. The prop on this boat turns 360 degrees, corresponding to the position of a knob on the steering wheel. The prop is located below the center of the hull, giving the boat amazing agility. Whichever way the boom man turns that steering knob is where the boat goes. Quickly. See the water splashing at the right of those bundles? This isn't done in slow motion. The work goes pretty fast. 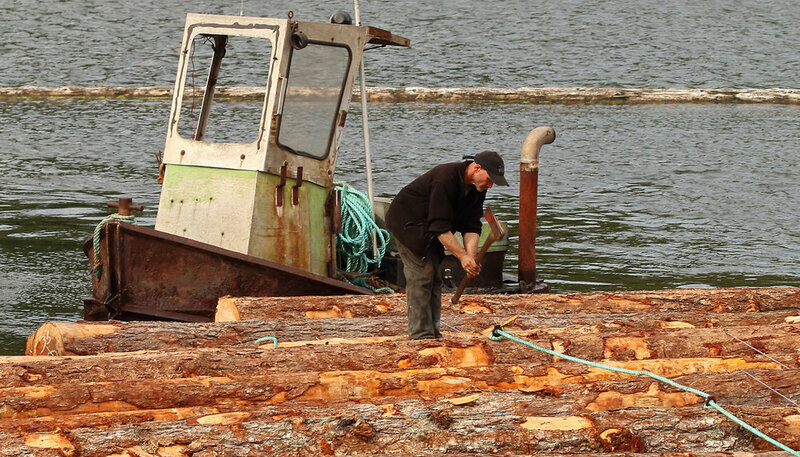 When a boom man builds a log raft he runs a cable or rope – a swifter – over the bundles, and uses an ax to hammer a log dog into each bundle. The swifter keeps the bundles from drifting out of alignment, or leaving with the tide, while the next bundles are being brought over. When the row is completed the swifter is removed from the previous row. The log dogs are knocked out of the wood with the back of the ax and the swifter is coiled. The log raft is surrounded by boom sticks. Those are spruce or hemlock logs 65 feet long with a hole across each end. A boom chain is run between each of the boom sticks to form an enclosure around the log bundles. The Sophia C stops by with supplies. And the boom man keeps working. Hands full and busy, watching the boat. Don't drop the pin in the water, don't drop the pin in the water! "...the way he maneuvered that boat was something to see...like an extension of his body. ...watching Tim was like watching a combination of dancer and strongest man competitor, how agile he was on the logs with super heavy coils of swifters on his shoulder, having to be fast and accurate--and what he did was absolutely essential. You really had to be there to get my dad's tone and his expression of complete, no holds-barred admiration. And my dad, with everything he's done in his life, is a hard guy to impress." Tim is mentioned in Tara's CCW article "The Secret Life of Logging Dogs." You can catch more of Tara's great Southeast Alaska writings in her blog and in her bi-weekly column in the Capital City Weekly. I did not receive any form of payment for the links to Tim and Theresa's B&B. I did receive photos and information to share with you and am saying "Thank you!" to them. Long ago in a remote logging camp in Southeast Alaska the boss decided that he needed a boat trailer for one of the boom boats. Boom boats are not very long, but they are deep and heavy. The trailer would have to be stout. It would have a long tongue so that they could back the boat deep enough into the water to float the boat off off the trailer. The boss decided that Henry was up to the job. "Henry! Samsonite needs a boat trailer. We're going to tow it overland to the other side of the island the morning after next. And don't go robbing anything off of working equipment!!" Henry nodded, collected up his lunch off of the spike table, went out to the equipment boneyard, and set to work. He gathered up a bunch of rebar from here and there and pulled some flat bar stock and angle out of the scrap barrel. Then he put his leathers on and went to work with his cutting torch. Henry took a back axle off of a log truck that the greenhorn had wrecked when he hotdogged down the mountain and missed a corner. Then Henry cut the reach (tongue) off of the truck, welded that onto a pipe from an old log tower, and welded that onto the axle. Now loggers were always losing the dang pin for the pintle ring, so Henry found a broken log chain over by the pile of shackles. He welded the chain onto the top of the pin and welded the hook onto the tongue. Let them try to lose that. Boom boat operators push big, heavy logs around for a living. Henry needed something hell-for-stout to stop the boat when the operator runs it up onto the trailer. He fired up the Cat 980 log loader and used the tine to dig around in a pile of metal that had been building up for a few years. There was that little platform built out of old metal shop building beams. Henry flipped it over with the 980, and then cut out a chunk of tapered i-beam. In that pile he also found some walkway grate and other treasures. Things were coming together pretty well by midday, so Henry pulled two sandwiches out of his lunch bucket and washed them down with a thermos of coffee. Then he fired up his welder and went to it. Now Henry figured that he could pretty well fab the trailer with chunks and scraps, but the fenders were niggling him. Plate steel was just too darn heavy and precious to use up on that. It sure would be nice if you could step up onto the boom boat from the sides, too. He tucked that thought away while he pulled the hinge pins out of the ventilation doors from an old generator shed. Those would be great bunks for the boat to sit on. There were a few leftover scraps of dock bumper to pad the bunks, so Henry quickly procured them. As Henry walked past the cookshack with the dock bumpers casually wrapped in a blue tarp, he noticed the tank for the oil stove. It reminded him of the 500 gallon fuel tank that was left over when they changed the generator out. Perfect for fenders! Henry cut the tank in half and cut the angles to lay the bunks on. He spent the afternoon welding and cutting and welding some more. Another day and things should be in pretty good shape. At dinner the boss came over to Henry with a scowl. "Henry," he said, "we need that boom boat on the other side tomorrow night. They'll be pulling it out no later than ten tomorrow morning." Henry finished his meal and went back to work. He made ladders out of scraps of bar stock and rebar. He made rails and reinforcements with angle iron and rebar. He pulled out his blacksmith hat and bent rebar to make a railing. It was getting somewhat late, or judging by the light to the east, a little early, when Henry realized that it would be best if there were a few safety features. He added rebar cleats to the walkway, but the walkway needed a railing, too. Henry was tired enough to be past "pretty" and "nice", so he grabbed a wicked looking piece of scrap metal and a length of conduit. He welded the scrap onto the trailer and then smashed the end of the conduit flat and bolted it to the scrap iron at the top. There just wasn't an elegant way to attach the conduit to the walkway, so he blew a hole in the conduit with a torch, welded a bolt in, and welded the bolt to the walkway. Henry knew that the boom boat wouldn't always come onto the trailer perfectly straight, so he added some exhaust hose as a bumper. He scrounged up some rope and attached the hose to the metal. He contemplated his prowess with rope and decided to stick with his torch and welder. A few finishing touches and Henry was done. The boss stopped by before breakfast. "Damn, Henry! That's a work of art! But what's with the shiny red and white stickers?" "Safety first, Boss," Henry said. *Disclaimer* I made this whole story up. Henry only exists as the men who made do with what was available during the logging camp era in Southeast Alaska. My hat is off to the person who fabbed up this boat trailer with inspiration, improvisation, and perspiration. Take the scraps of your day and make something that works! P.S. I know that the last two posts have been whimsical. I'll get serious in the next post or so. Don't give up! I haven't lost my grip on reality entirely yet. Boom boat: A small powerful boat that is used to push logs, log bundles, boom sticks, and other wood around in the water. Boom sticks: The logs that are chained together to contain the log raft. Spike table: A table with lunch items. The loggers pack their lunch off of the spike table in the morning. Rebar: Steel reinforcing rod for cement work. It's like duct tape - a staple of bush camp work. Pintle ring: What the pintle hitch attaches to. Cat 980 log loader: Like the 988 below, only a little bit smaller. Don't be fooled by the delicate work this loader is doing. It can grab a whole load off of a truck.